When I return to a city I’ve been before, I like to try to do some completely new activities to keep it fresh. For our trip to Venice, I researched the possibility of taking an excursion to the neighboring islands, Burano & Murano. It is nice that the 48 hour vaporetti pass we bought enabled us to take the boats out to the islands for free. 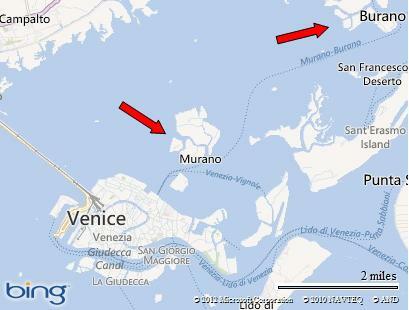 Line 12 goes to Burano, and there are 3 vaporetti that go to Murano, Line 3, 4.1 and 4.2. We decided to start in Burano. Burano is known for it’s lace-making and colorful buildings. It was about an hour trip from Ferrovia Station in Venice, which was right beside our hotel of choice, Boscolo Bellini. We were both hot messes when we docked in Burano, since the temperatures were in the low 90s with 90% humidity. It was worth it though. I soon forgot it was hot as we kept uncovering more colors. There were lots of audible gasps from me. Gabe commented that if my aunt A had come, there would have been ten times the number of gasps. In Burano, we stopped at an adorable restaurant, Riva Rosa, for a delicious fresh sea bream lunch. They grill the whole fish, along with vegetables, and filet it for you table side. The service was very good and we were happy with our selection. It was perfect way to recuperate from the temperatures for a bit. After lunch, we continued to Murano, which is known for glass. We were both exhausted and hot after a half hour, so it didn’t get the same attention from us that Burano got. 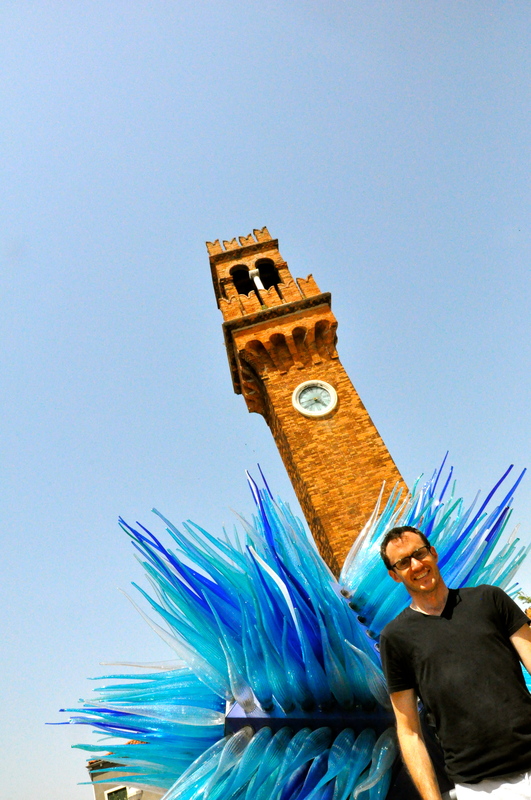 Which could be a function of doing it second, but honestly, the Murano glass shops seem to blend together after while. One benefit of visiting the islands, is that aside from the crowded vaporetti, these places were less crowded than the streets of Venice. Venice can make me claustrophobic with its hoards of tourists. Not that I am suggesting Murano or Burano aren’t frequented by the tourists….it just seems to be more peaceful* than centre city Venice. We started a new habit of buying a small thing for our home from the places we travel so that we can remember the trips we did during our time in Europe. We ended up with a beautiful Burano lace piece that is used for serving bread, as well as 6 Murano cocktail glasses (one of which is orange/maroon — Hokie colored!!). We hope to have you over some day to enjoy them with us. *If you go to Venice, please make sure to try to visit the quiet neighborhoods off the beaten path. They are much more quaint and you can get a feel for how the Venetians live on a day to day basis. There are also lots of shady alley ways that can provide some relief from Italy’s scorching summer sun too. This entry was posted in Summer, Travel: Europe. Bookmark the permalink.